This month, one of the most important financial tasks that you need to accomplish is completing any necessary 1099 returns for your team, contractors, and company vendors. For many business owners, this can be a source of great stress, because of the tight deadlines and the fear of the huge penalties for doing them wrong. I promise – it’s easy. And I have a 4 step process you can walk through to take care of them right now. You will need to have a list of everyone that you paid throughout the year so that you can review it during this exercise. The easiest way to pull this report is from QuickBooks (assuming you have your records all updated in there). You can use the Expenses by Vendor Summary report (but you will want to double check this, because if you made an error and paid someone as a ‘customer’ then they won’t show up on this report. You can also run a Profit & Loss report and click into each account to see who the vendors are that have payments posted to them and make a manual list. 1. Did you pay them for services? 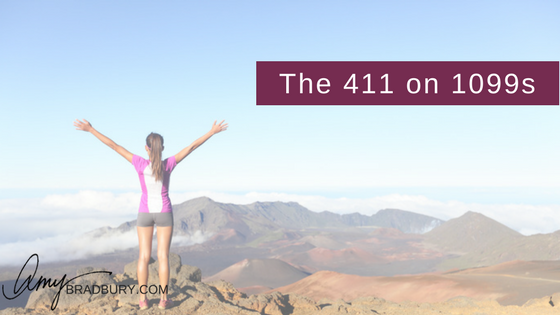 You only need to issue a 1099 to those vendors who provide you with services. For example, your graphic designer, business coach, virtual assistant, etc. You don’t need to send one to someone who you bought a book from, or office supplies, etc. 2. Did you pay them via check? This is my favorite one, because it saves so much work if you have paid everyone via PayPal, credit or debit card (like most of my clients do). This is a recent change to the 1099 rules, and it’s one that often missed. You only need to issue a 1099 for payments made via check, wire, or electronic payment from your bank account. 3. Did you pay them more than $600? This is pretty self-explanatory. Only amounts more than $600 have to be reported on 1099 returns. If you paid someone partially via checks and partially with credit cards, only total the amount paid via check. 4. Are they an LLC or Sole Proprietor, Estate or Partnership? To answer this question, you will need to look at their W-9 form, specifically box 3. If they have checked the first box “Individual/Sole Proprietor or Single Member LLC”, the 4th box for partnership, or the 5th box for estate then you will need to issue them a 1099. If you don’t have a W9 on file for them, request it from them ASAP! Use this link to download and send to them. *Pro-Tip* Anytime you hire a new vendor, get their W9 right away as part of your onboarding process – before you pay them! That will save you from scrambling to gather them next January. 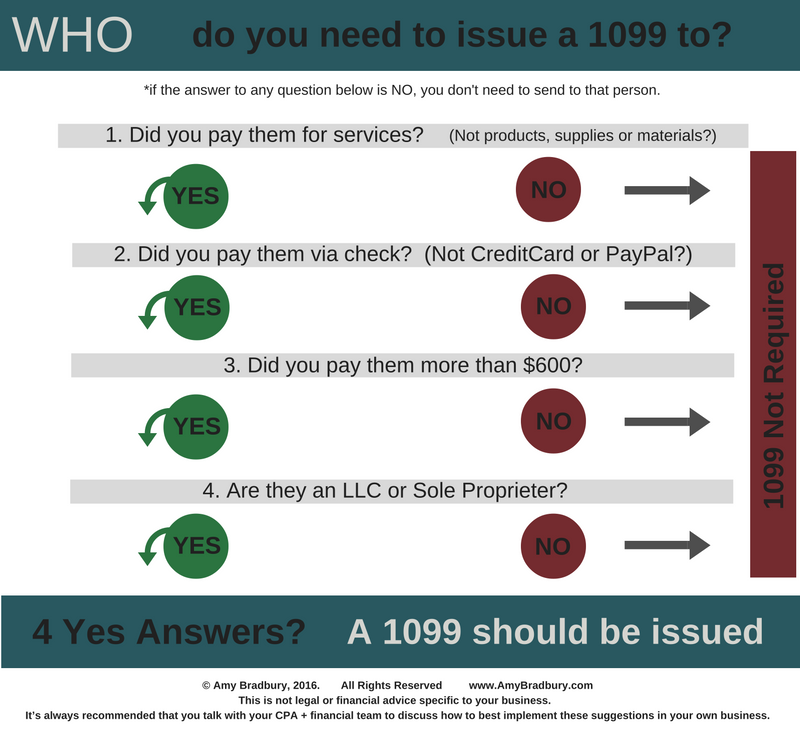 Now that you know WHO you need to issue your 1099 returns to, you can use an online software like Track1099.com to actually issue them. No need to trek to the office supply store to buy a package of the forms, struggle with the alignment on your printer, papercut yourself trying to stuff all of the envelopes. 🙂 Make it easy on yourself and use Track1099.com. You just enter in the information and they send the 1099 returns to everyone via email. It’s totally secure because the recipient has to verify their identity before downloading their form. And, they take care of submitting everything to the IRS on your behalf, which is HUGE since the penalties (up to $100 per form!) for late filing can really add up. There has been a change in the due date this year for 1099s – they are due to both the recipient and the IRS by January 31st. Hi, Amy. This is such a helpful post. I’ve been an independent contractor for a few years now. I remember the days when it was an automatic that the client sent 1099’s. I saw this change around 2008. This is such a valuable service as more and more people are self-employed or maintaining a side gig. I shared on Twitter and Pinterest for you as it is something I think all V.A.s need to know. I never thought about asking for the W-9 for subcontractors. I’m sure I’m not the only one.